Location: 1720 South Scenic Highway in Chattanooga, Tennessee. The entrance to the Ruby Falls cave tour is about 1/3 of the way up Lookout Mountain. 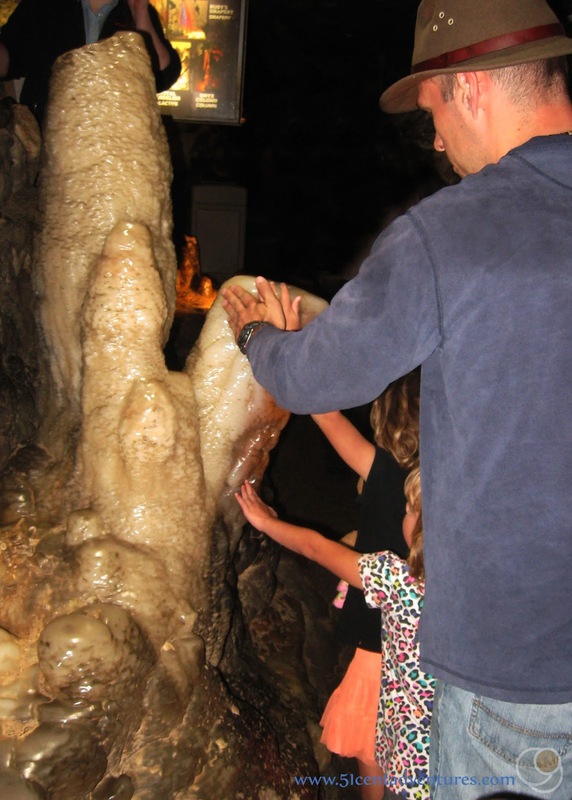 Cost: Cave Tours cost $19.95 for an adult and $11.95 for a child ages 3-12. Operating Seasons and Hours: 8:00 am to 8:00 pm every day of the year except Christmas Day. This was the first stop of the second day of our road trip to the Lookout Mountain area of Alabama in April of 2016. We left our campsite at DeSoto State Park, and drove up Interstate 59 through Georgia to Chattanooga, Tennessee. I'm sure you are wondering, "wait, I thought this road trip was just going to focus on the parts of Lookout Mountain that are in Alabama. What are you doing in Tennessee?" That's a valid question. Most of Lookout Mountain is in Alabama, but it stretches into Georgia and originates in Tennessee. 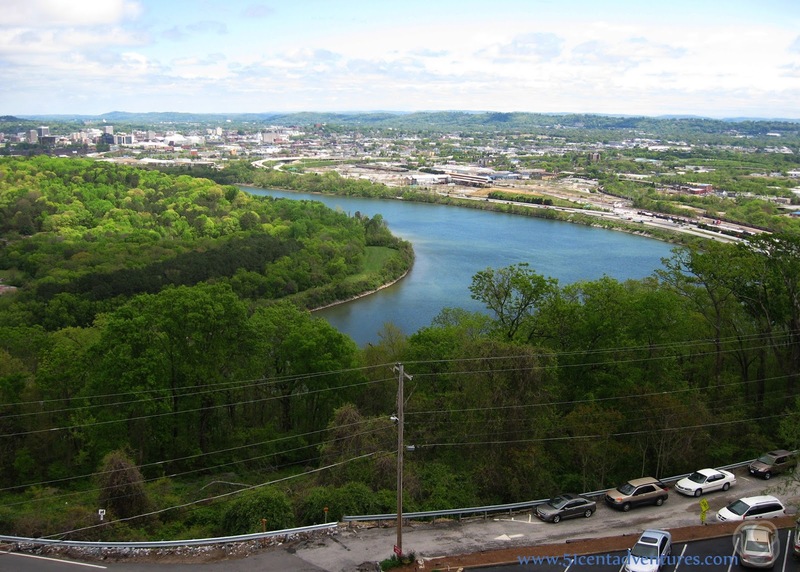 Limiting ourselves to only the Alabama parts of Lookout Mountain would be a serious oversight. 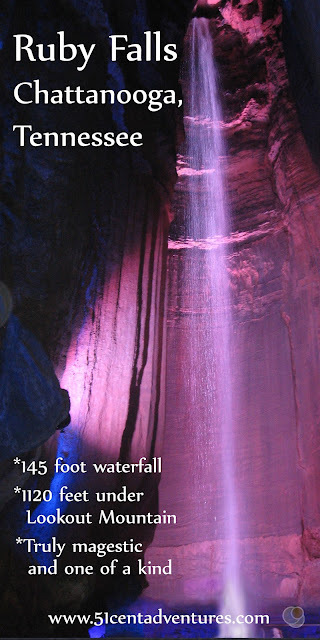 Especially since Ruby Falls in Chattanooga, Tennessee was one of the main reasons I started planning this road trip. Last year, on our way from Utah to North Caroline I saw a picture of Ruby Falls on a brochure at a rest stop. Every since I saw that picture I knew I HAD to see this waterfall in person. I would have been willing to go to Chattanooga just to see the waterfall, but it seemed like a good idea to turn it into a road trip and add on some other things to see and do in the area. So we went to Chattanooga Tennessee and followed the signs to Lookout Mountain. I was actually surprised when we arrived at the entrance. Somehow I thought that the entrance to Ruby Falls was on top of the mountain. But really we were only about a third of the face up the face of the mountain. The entrance was located inside a building that looked like a castle. This building was constructed from rocks excavated from the cave down below. We went inside the entrance building and bought our tickets. Adult tickets were $20 and the kids were each $12 (except for our two year old who was free since she was under three years old). Add that up and this was the single most expensive thing we've ever done as a family. However, I felt like it was worth it to see such a unique waterfall. One thing I worried about was that we'd pay all the money for the tour, and then the kids would whine the whole time. I'd asked several friends if they thought my kids would do okay. They said, my kids should be fine, but to make sure we used the bathroom before going down into the cave. So we used the bathroom and gave the kids some snacks. Soon the next tour was announced. We excitedly got in line. Almost before I could think about it we were on an elevator descending down into the mountain. The elevator had a glass door. We could see the solid rock passing by. The elevator opened, and we found ourselves inside the cave. All the kids were really excited. I'd been worried that my son might freak out on us, but he was pretty happy to be "in the tunnel." Our tour guide had us watch a quick video about the history of the cave. I found it very interesting. Here's the gist of it. Lookout Mountain has always had a cave that people explored for centuries. But it was closed to the general public when the Tennessee Valley Railroad had to build tracks near the opening. Leo Lambert knew of the cave and wanted to open it to the general public. In 1928 he started drilling an elevator shaft in the mountain with the plan to reach the cave that way. As the elevator shaft was being drilled an opening was discovered at 260 feet down. This was still over 150 feet above where they expected the Lookout Mountain Cave to be. Mr Lambert and a few people went down to investigate and found a small opening 18 inches high and 5 feet wide. 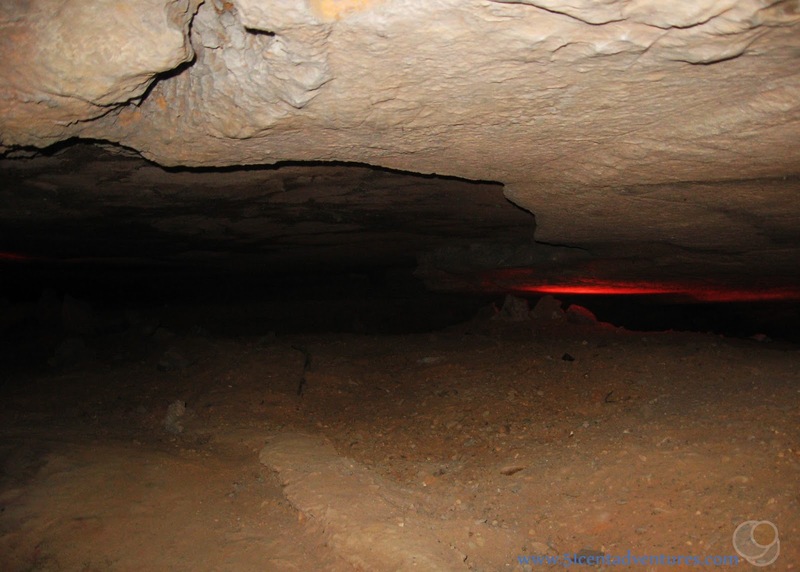 This is what the cave looked like when Leo Lambert first explored it. They crawled through that opening for over 7 hours, and traveled 750 feet before they came to an area where they could stand up. 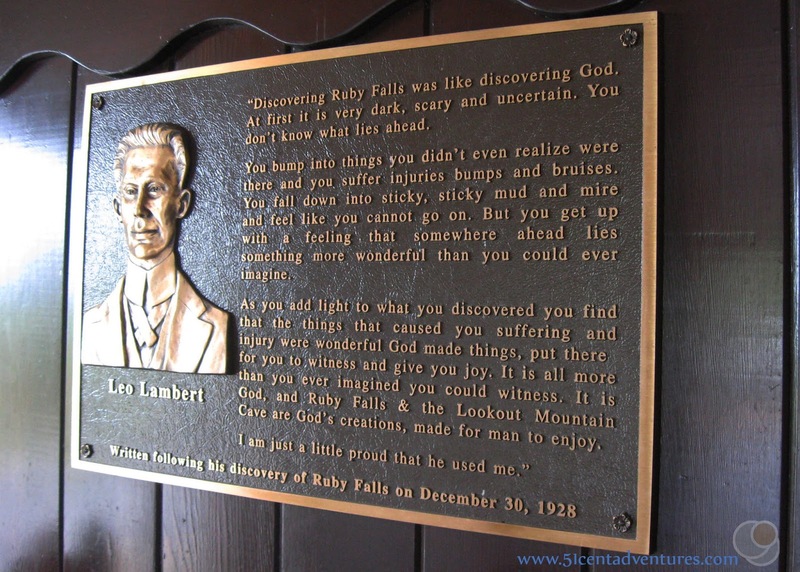 Then they continued exploring the cave and discovered interesting features including a waterfall that Mr Lambert later named for his wife, Ruby. They returned to the elevator shaft 17 hours after they first left. 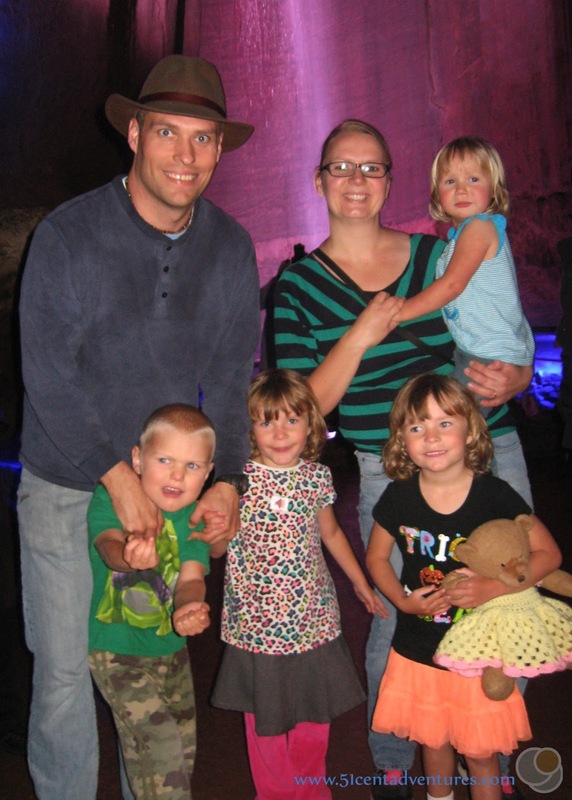 The elevator shaft was eventually drilled down to the original Lookout Mountain Cave. 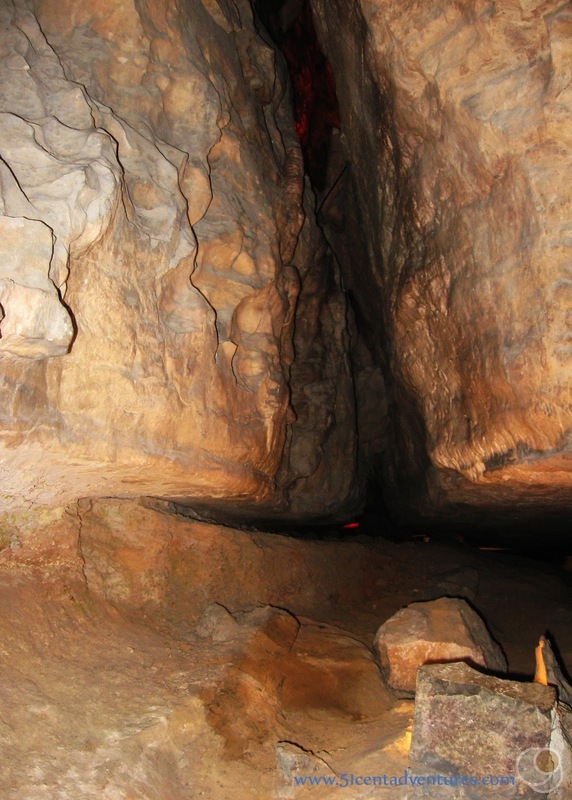 Both the Lookout Mountain Cave and Ruby Falls routes were excavated to make them more accessible, and cave tours were offered for both places. But Ruby Falls ended up being the more popular tour. After 1935 they stopped offering tours of the Lookout Mountain Cave. I hadn't realized that Ruby Falls was a relatively recent discovery. This made me more excited to see the waterfall. Our guide took us though the cave, and we were able to touch some features as we traveled. The original route had been excavated so that people could easily walk along a path rather than crawl between stones. The stones that were excavated were used to construct the building up above us. Our route was about half a mile long. We actually ended up 10 feet higher than we were when we started at the bottom of the elevator shaft, but because Lookout Mountain itself was higher here we were 1120 feet underground. Then it was time to approach the waterfall. This is what I'd been waiting for since seeing that brochure picture all those months ago. Our tour guide told us that it would be dark when we first went into the waterfall chamber. She said that after about a minute the lights would come on and we would see the waterfall. This was so everyone could see it for the first time together. My family was in the front of the group, and so we walked into the chamber first. My five year old twin girls held my hands as we walked into the stone room. I could hear the water running over the falls and splashing down. There was low music playing. I felt almost like I was approaching a holy place. I was full of anticipation. Then the lights came on, and the music triumphantly proclaimed that THIS what what we'd been waiting for. Suddenly all 145 feet of cascading water was visible. It was amazing. Here was this waterfall that had been flowing for thousands, if not millions of years, without anyone ever seeing it. And then somebody found it because they wanted to go exploring. And now here I was, little insignificant me, and I could see this beautiful creation. It was one of the most profound moments of my life. My two year old daughter was not very happy about the whole thing. She was scared of the dark and then she was scared of the music. She'd been fine during the cave tour, but she wasn't a fan of the waterfall. Good thing her ticket had been free. The twins loved it though. They were jumping up and down with excitement. At one point one daughter ran over to the tour guide and told her something along the lines of, "Thank you so much for bringing us here. I love this waterfall!" My son was also really excited about the waterfall. He has a speech delay, but that didn't stop him from saying, "Water Fall" over and over again. All too soon the tour guide told us that we had about one minute left before the lights would dim again. I wished that we could stay longer. Soon the lights dimmed and the music ended. The waterfall kept flowing, just as it has for eons. It's kind of comforting to think about how it's still flowing right now. I found out later that the cave is starting to offer extended tours that allow for more time at the water fall. I would definitely be interested in one of those tours. My two year old was still scared so she wanted me to carry her out of the cave. The things we passed on our walk back seemed slightly boring compared to the waterfall we'd just seen. But it was cool to get another perspective on the passageway. We made it back to the elevator shaft and took the elevator back up to the surface again. We were let out onto the viewing platform of the lodge building. We walked up some stairs and were able to get a good view of the Tennessee River Valley. I'd never seen Chattanooga before and I through it was very pretty. 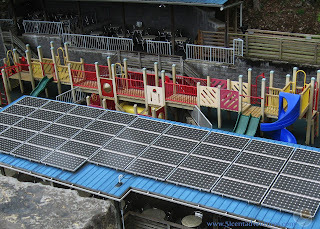 We also had a great view of the solar panels that power the lights in the cave. And we could see the playground. My kids all went down and played on that for a little while. There was also a cafe where we could have ordered food. After about a half an hour we went back to the car. On our way there we passed a sign that we'd somehow missed seeing on the way into the building. 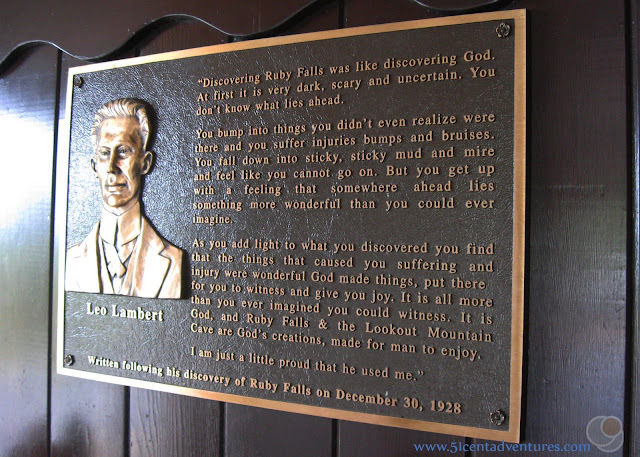 It had Leo Lambert's thoughts on discovering Ruby Falls. "Discovering Ruby Falls was like discovering God. At first it is very dark, scary and uncertain. You don't know what lies ahead. You bump into things you didn't even realize were there and you suffer injuries bumps and bruises. You fall down into sticky, sticky mud and mire and feel like you cannot go on. But you get up with a feeling that somewhere ahead lies something more wonderful than you could ever imagine. As you add light to what you discovered you find that the things that caused you suffering and injury were wonderful God made things, put there for you to witness and give you joy. It is all more than you ever imagined you could witness. It is God, and Ruby Falls, and the Lookout Mountain Cave are God's creations, made for man to enjoy. I am just a little proud that he used me." As I look back on our trip to Ruby Falls I have similar feelings. I felt God's Love - a powerful, beautiful force, when I saw the waterfall. And just like God, Ruby Falls is always there, always flowing. Even when I'm not there to see it, the waterfall is flowing. Waiting for me and waiting for you. I don't know if going to Ruby Falls will end up being a religious experience for you, but you will come away from that waterfall feeling transformed. It is so beautiful, and the music and the lights enhance the experience. You'll come away knowing that you have visited someplace special, and yes, even a little sacred. Recommendation: Ruby Falls is one of those truly unique places that you have to see. 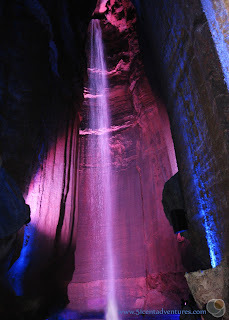 If you will be near Chattanooga you should plan to visit Ruby Falls. Don't worry about the cost. It will be worth it. 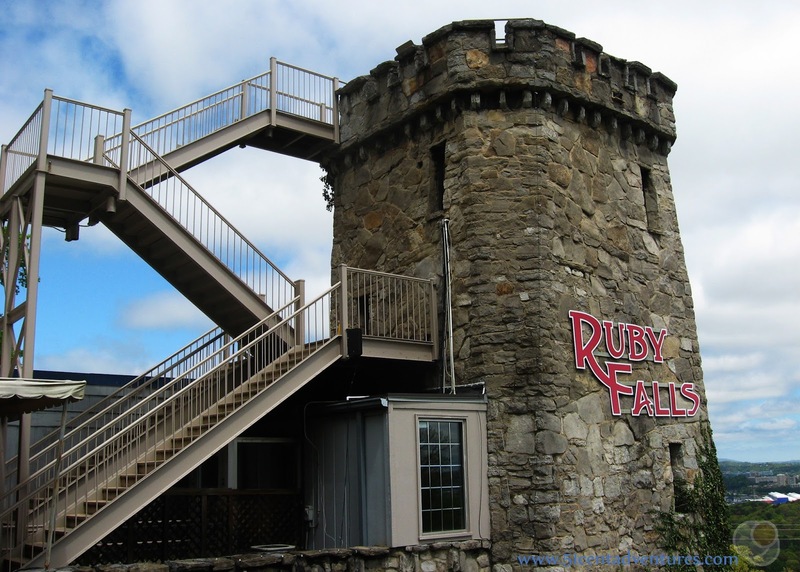 Directions:The entrance to Ruby Falls is located on the Northeastern face of Lookout Mountain. This is the part of the mountain that faces Chattanooga and is only a few miles south of downtown. Places Nearby: There are two other famous Chattanooga area attractions on top of Lookout Mountain. 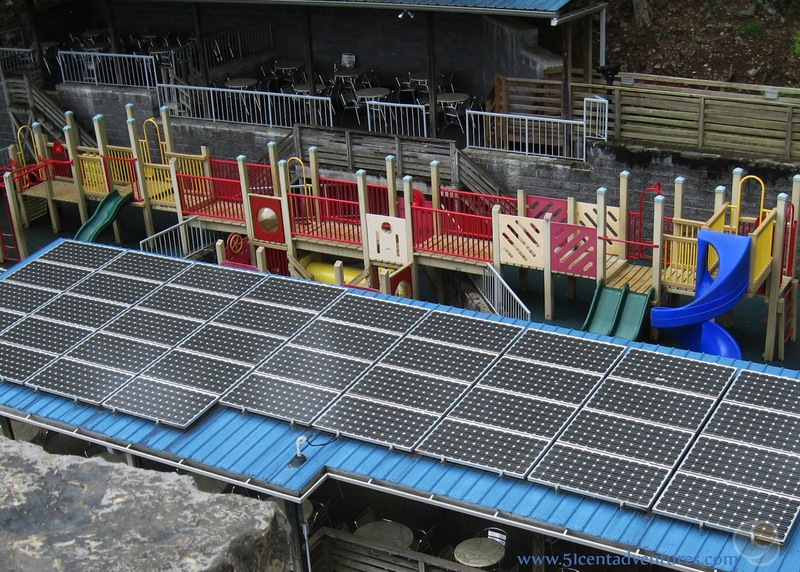 They are the Incline Railway and Rock City. The Incline Railway takes you up the side of Lookout Mountain. Rock City is an area on top of the mountain with viewpoints and gardens built along a path. If you are planning to visit these place you can add them to your Ruby Falls ticket and receive a discount. We chose not to do that because even with the discount the cost of visiting these places was high. 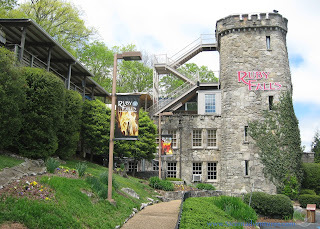 We were already paying quite a bit more than we usually do to visit Ruby Falls. I just couldn't bring myself to add the expense of also visiting Rock City or the Incline Railway. 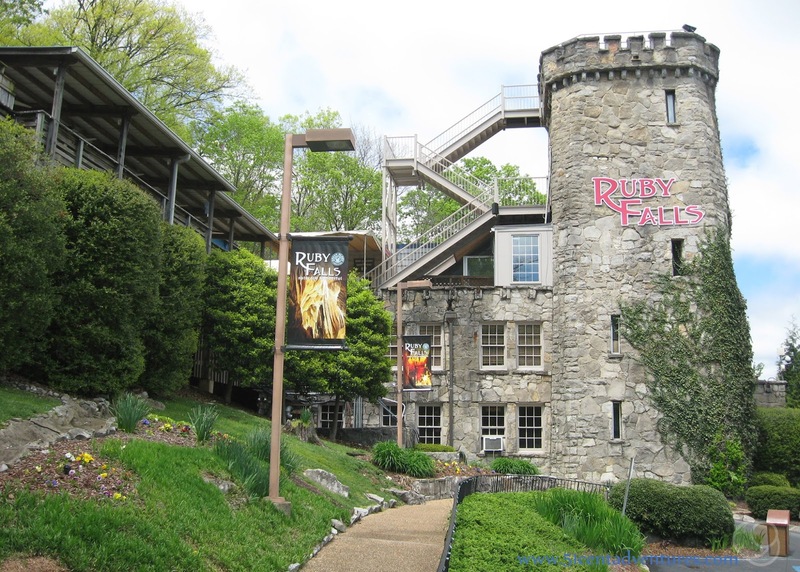 One thing to keep in mind is that Ruby Falls, the Incline Railway, and Rock City are not very close to each other. I assumed that since there was an option to buy a combo ticket that they'd be right next to each other on top of the mountain. But really Rock City is four miles away from Ruby Falls. So don't worry about your kids seeing these places and begging to visit them while you are at Ruby Falls. If you want to get a good view from the top of Lookout Mountain visit Point Park. This is part of the Chickamauga and Chattanooga Military Park operated by the National Park Service. Entrance to the park is $5 for an adult and free for anyone under the age of 16. In addition to getting one of the best views of the Tennessee River Valley you'll also learn about this area's importance in the Civil War.